We’ve over 40 years experience in designing and manufacturing bird scarers, right up to our current Bangalore Broadside Mk 2 model. 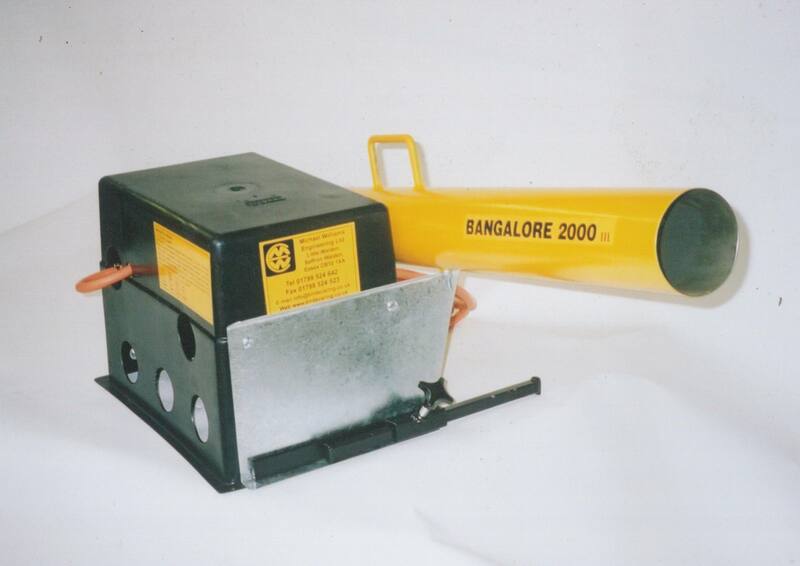 Since the Bangalore Bird Scarers were first developed in the early 1980s, we’ve constantly improved and refined the Bangalores to make the best use of new technologies and customer ideas. The Bangalore Broadside Mk 2 is the latest in a long line of Bangalore Broadside Bird Scarers. We asked the best experts we knew – our customers – for their feedback. And the response was overwhelming. We’ve taken all our customers’ ideas on board and have developed – what we feel – might be the world’s most advanced electronic bird scarer. The Bangalore Broadside Mk 2 knows when sunrise and sunset occur and will automatically fire only during daylight hours, if you wish. Just set it up once – tell it the time, date and location, and it’ll automatically comply with the NFU guidelines forever more. And you can easily over-ride these features if you want more advanced scaring options. Automatically puts its clock back at the end of October and forward again at the end of March. It’s a cold, dark Sunday in October and you’ve got to go round all your bird scarers scattered throughout all your fields to put the clock back an hour. Not with the Bangalore Broadside Mk 2. 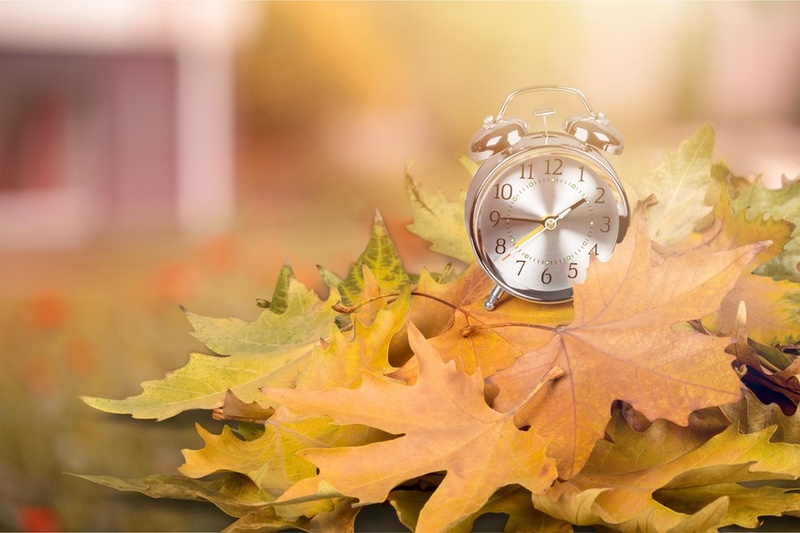 It automatically puts its clock back an hour at the end of British Summer Time each October. And at the end of each March, it automatically puts its clock forward an hour for the start of British Summer Time. Some of our customers have 70+ Bangalore Bird Scarers – imagine the time it’ll save you! We’ve redesigned the control board from scratch. It’s far easier to program than ever before but offers tailored bird scaring patterns to get the right level of scaring just right for you. And reliability was very much a priority. The Bangalore Broadside Mk 2 control panel is our most reliable and robust yet. One of the most requested features by our customers was a simple means of securing the Bangalore Broadside to deter tampering. 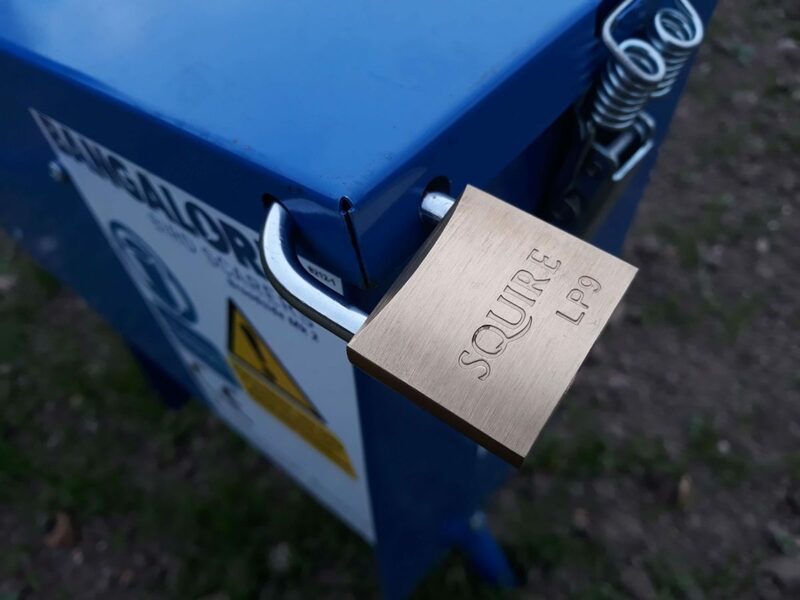 Just slip your padlock through the holes in the lid and secure. Stops opportunistic mucking about with your program, disconnection of the battery or turning it off. It’s cold, it’s wet, it’s starting to get dark. You’ve just set your bird scarer up and you want to make sure it’s going to work without having to hang around. Just tap the Test Fire button. You’ll get a 15 second countdown before your Bangalore Broadside Mk 2 fires a test shot. You can then leave it knowing that it’s set up correctly and is going to protect your crops while you get back in the warm. Michael Williams established his own company in 1974 in the midst of a recession after being made redundant. His background in agricultural engineering greatly influenced his ideas and designs for improving automation and reliability in agricultural industries. 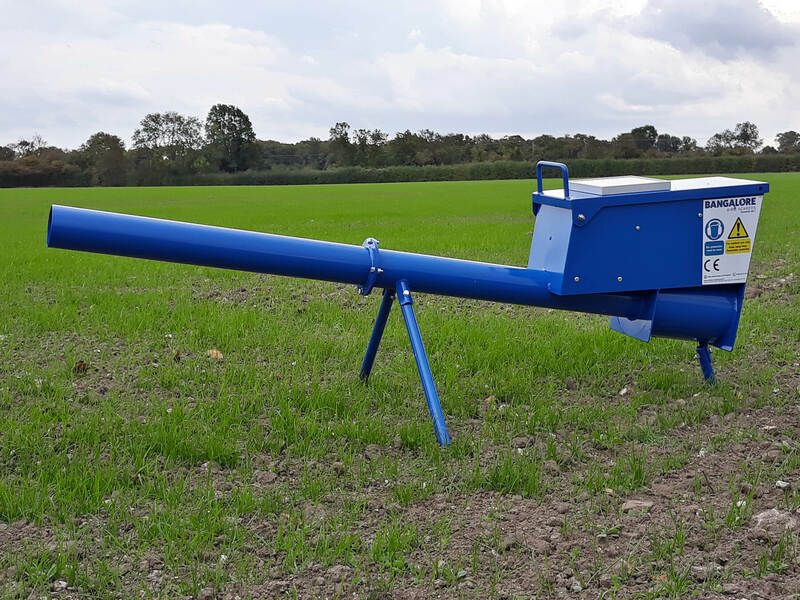 Our first venture into the world of automatic bird scarers was the ScareAway, an 8 foot, robotic tripod with rotating head and arms with flailing streamers. It stood on long legs, several feet above the crop so that its flailing arms would scare birds away. It also had optional air horns to for extra scaring. It piqued the interest of a Japanese company that imported several of the devices. Mike was so tickled that the Japanese, the pioneers of robotics at the time, would buy a robot from a UK-company that he sent out a press release about a small UK company exporting its robots to Japan. It was jumped upon by the UK media and resulted in several radio and BBC television appearances. 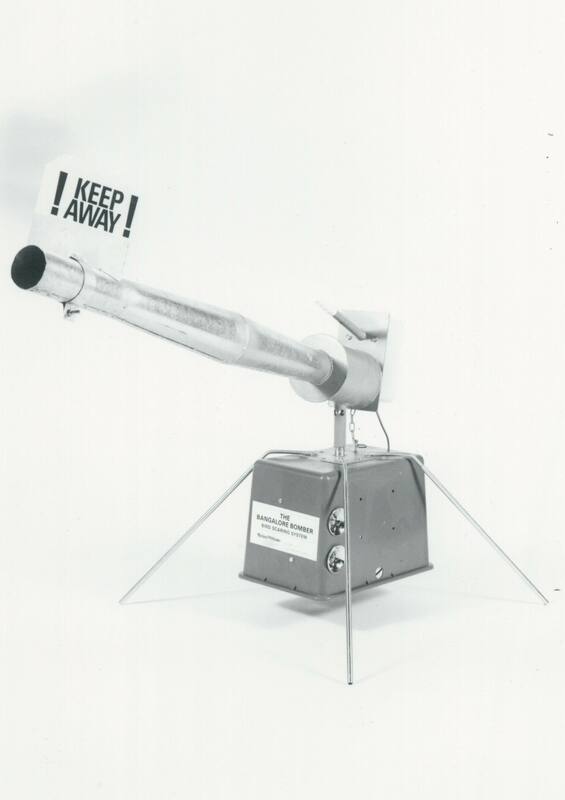 Automatic gas-powered bird scarers, up until now, were pretty basic. They consisted of a mechanical clockwork timer, that needed winding up regularly, a set of bellows to inject the gas, and a flint and steel on a mechanical arm to ignite the gas. Needless to say, they were very hit-and-miss and unreliable. Michael Williams had heard about all these new-fangled microchips coming out of Japan and wondered if they could be used to build an electronic bird scarer that controlled the timing, gas injection and ignition with microelectronics. 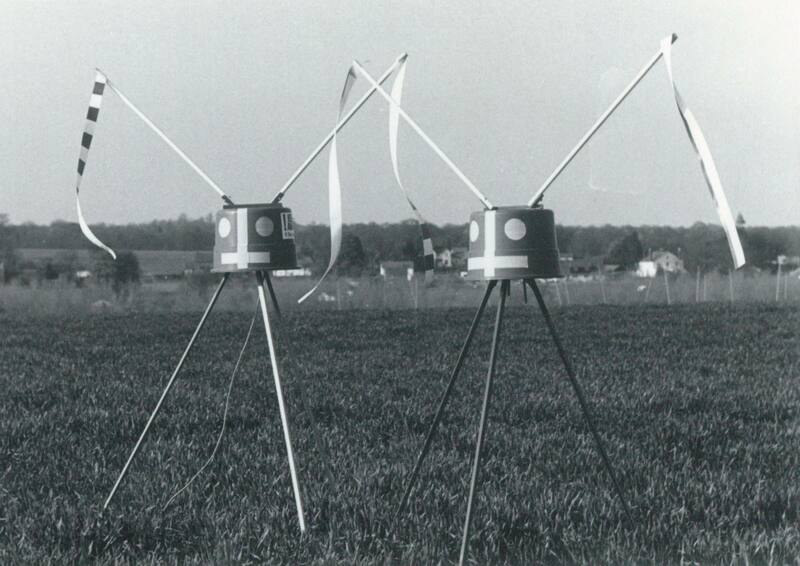 The ScareAway gas powered bird scarer, one of the very first fully electronic controlled bird scarers, was born. The next reincarnation of the ScareAway gas powered bird scarers saw improvements to the electronic control box. It had 2 simple knobs to set the number of bangs and the time between firings. It retained the wind-training fin and swivel system to ensure it always fired out of the wind to increase its reliability. Renamed the Bangalore Bomber Bird Scarer, it became an instant hit. 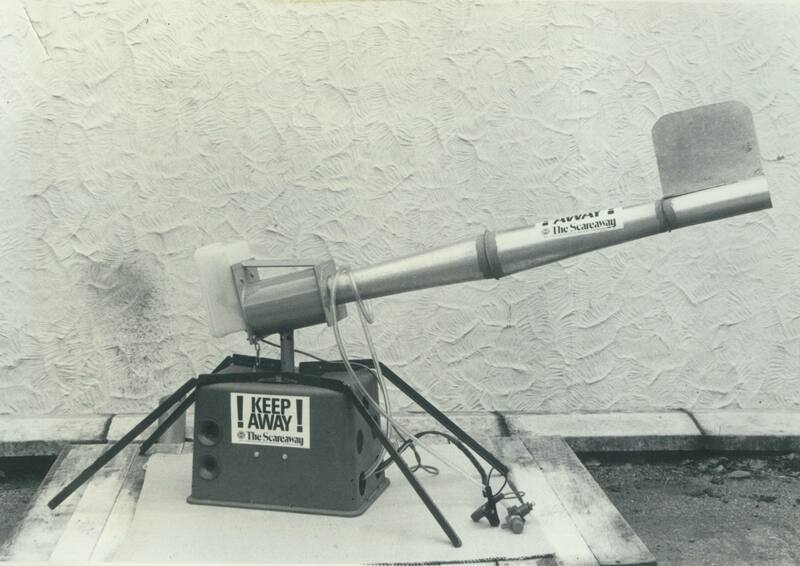 The Bangalore Bomber Bird Scarer, with its vastly improved reliability and performance, became an instant hit. 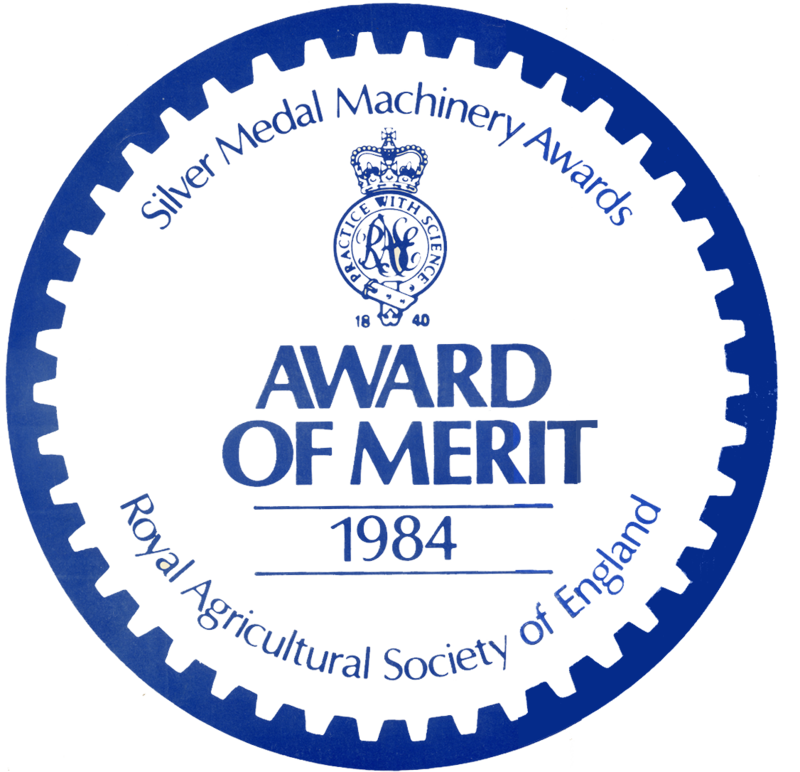 Selling hundreds of units a week, it won the Award of Merit in the Silver Medal Machinery Awards of the Royal Agricultural Society of England. Michael Williams was presented with his award at the Royal Agricultural Society show by Princess Michael of Kent. With the massive success of the Bangalore Bomber, Michael Williams was receiving many phone calls from farmers who had competitors’ guns but wanted the reliability of the Bangalore’s electronics. The result was the Bangalore SureFire. a kit for self-installation that replaced the old, unreliable mechanical timing and ignition system of the guns with the Bangalore’s electronics. Michael Williams realised that scaring birds was much more effective when combined with a visual threat. The Bangalore Bomber mimicked the sound of gunshots, but Mike wanted a visual threat associated with it. 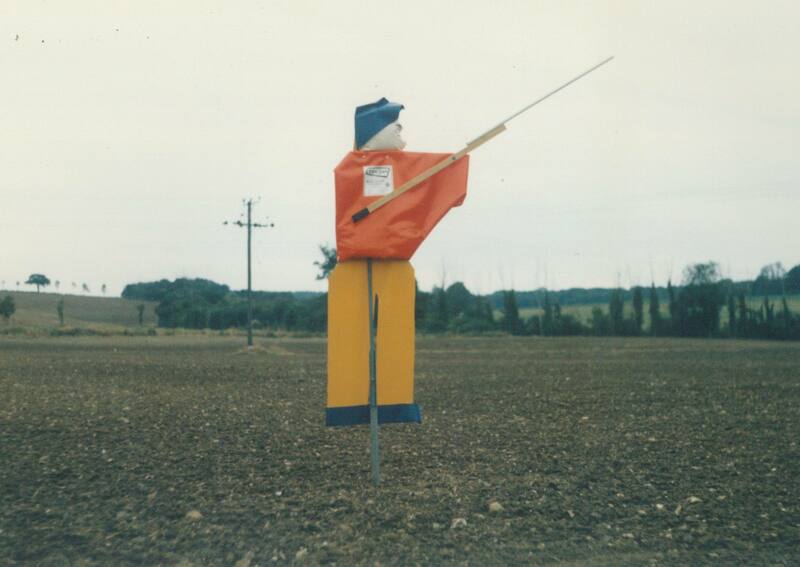 Using the help of a work-experience student, Mike designed a silent scarecrow made from hi-viz truck sheeting complete with counter-balanced “gun”. Scaring birds was much more effective with a bank of Ben Guns swiveling in the wind next to the Bangalore Bomber. Another instant hit, they sold hundreds of units throughout the year. 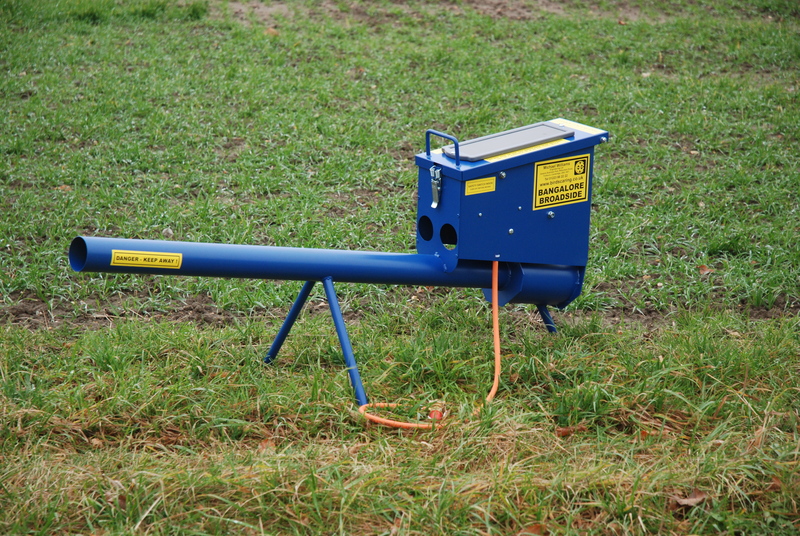 In a bit of a departure from gas bangers, Mike Williams looked at alternative technology for scaring birds from fields. The Blitzo consisted of a pair of high-power loudspeakers mounted in a deflective shroud that directed sounds into the field. In the control box on the floor was a compact cassette player with an endless 5-minute tape inside (don’t laugh – this was really cutting-edge in 1987!). 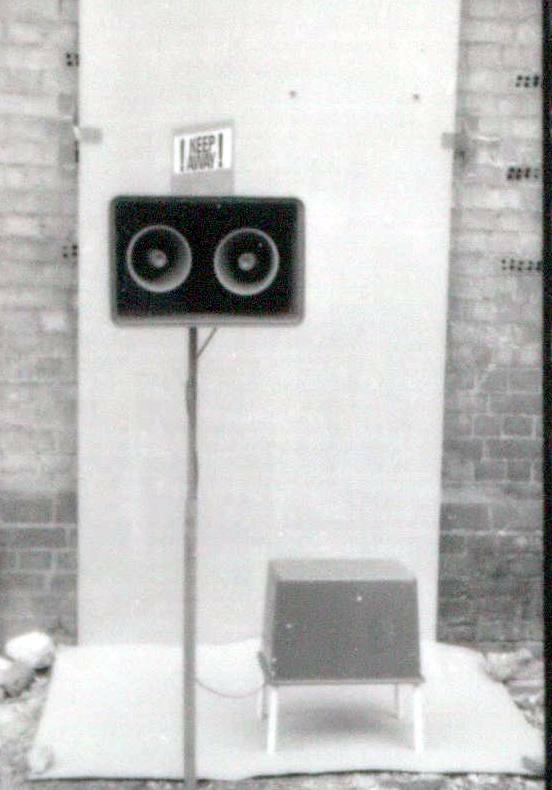 The tape had sounds recorded on it specifically chosen to scare birds from the field, such as the sounds of flocks of pigeons taking off from fields, dogs barking, people shouting and even some orchestra hits (it was the 80s, after all). With the rapid evolution of electronics over the years, the Bangalore 2000 used a new contorl box that offered many more features than before. The Bangalore’s famous half-hour slots were introduced, giving you complete control over a 24-hour period to generate your own, custom scaring patterns. 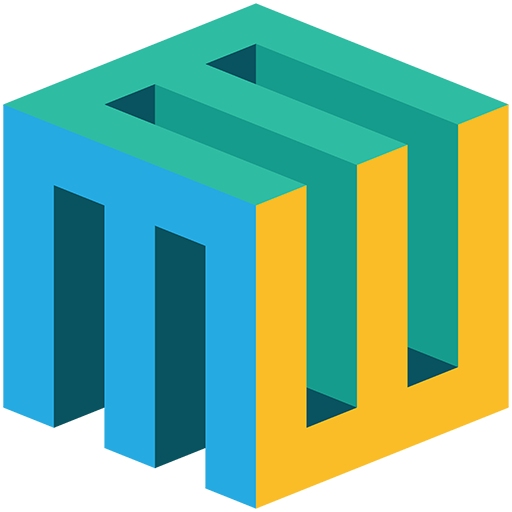 This feature was instantly copied by our competitors. 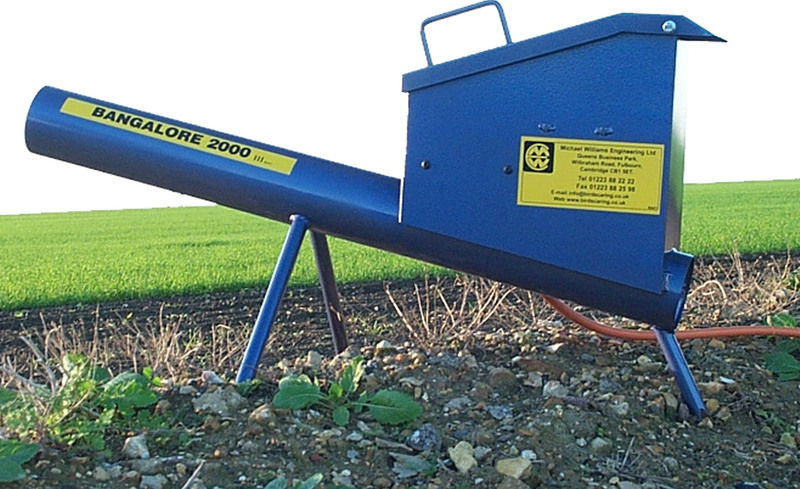 The Bangalore 2000 proved to be another hit with farmers in the UK and around the world. The chassis and barrel were upgraded to make them more stable in the field. This was the first model that introduced the characteristic blue barrel and 3-legged stability. We’ve never been one to rest on our laurels and when the time came to redesign the Bangalore Bird Scarer, we looked at what the latest technology had to offer. Battery technology had developed significantly, so much so that smaller, higher powered batteries were an option to power the Bangalore. Carting an old, heavy tractor battery up into the field to power your Bangalore seemed archaic. Further, solar panel technology had developed sufficiently to make small, trickle charging panels cost-effective. The Bangalore Broadside Mk 1 was therefore one of the world’s first solar charging gas-powered bird scarers. 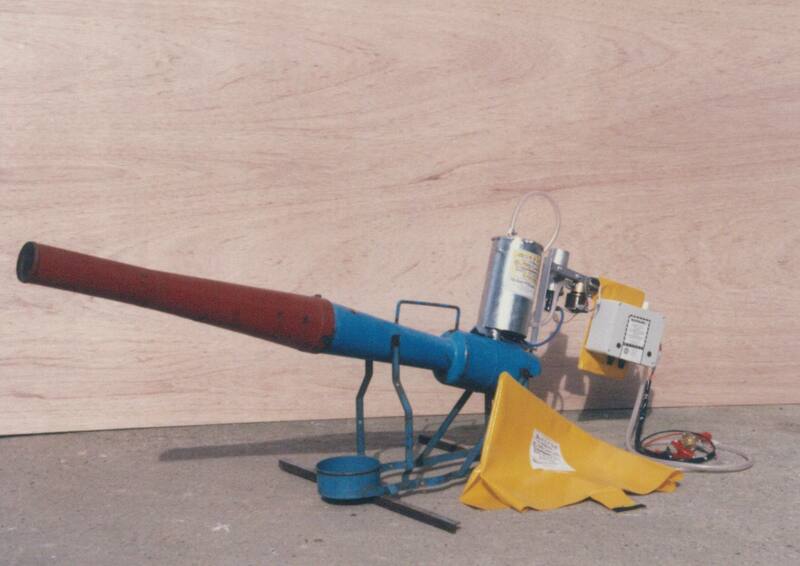 We reached a cross-roads in 2007 wondering if gas-powered agricultural bird scarers had had their day. We therefore contacted all of our Bangalore customers to ask if they saw them featuring in their future crop protection and, if so, what features they would like to see. We had an overwhelming response and our customers certainly felt they played a valid part in their crop protection. 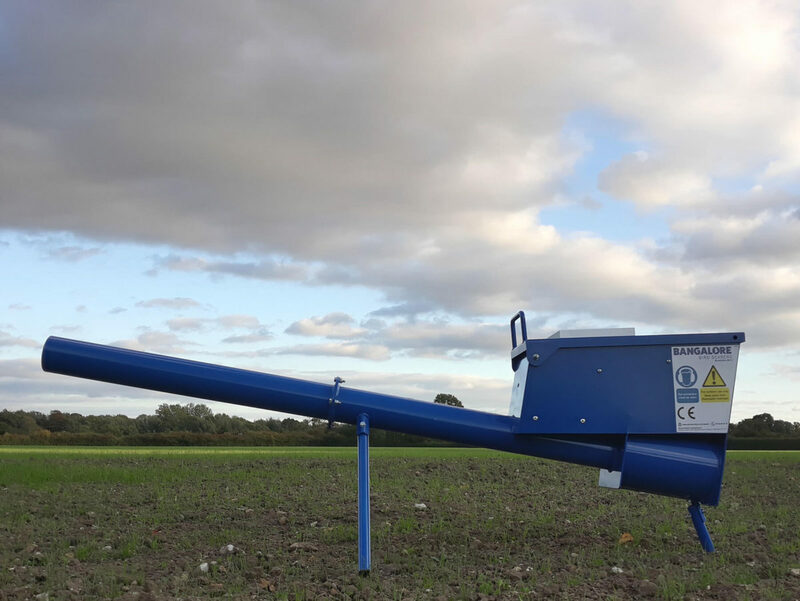 We were mindful that a new bird scarer should easily comply with the NFU guidelines but still offer the flexibility to provide tailored scaring patterns. Plus, it should be far easier to use than ever. The Bangalore Broadside Mk 2 is therefore our easiest, most advanced and most reliable bird scarer ever.